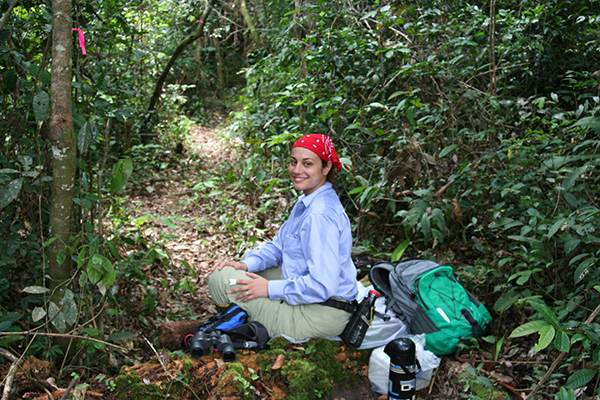 A Brazilian who first came to the U.S. for college, assistant professor of biology Anita Stone has returned frequently since 2000 to her own northern region of Brazil to watch squirrel monkeys in the forest. The females there pick their mates, and appear to have a weakness for bulked-out upper bodies. In college, I knew that I wanted to do something with ecology. I grew up on the coast in Brazil, so I was thinking I might be a marine biologist. But on a summer program in Costa Rica, I fell in love with tropical forests. And monkeys. 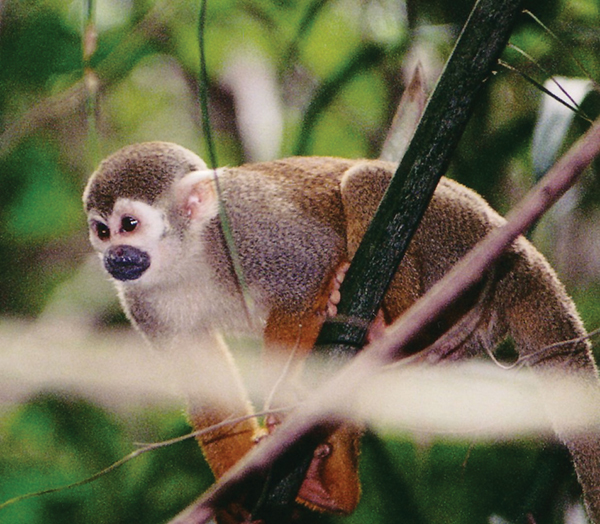 I said, “This is it.” I picked squirrel monkeys during my first year in graduate school, and now I study just one of the seven species. Beyond that, I love nature and just think it’s important to know how it works. How do you follow monkeys around if they live in trees? Squirrel monkeys like being lower in the tree canopy. Which is good. Sometimes they come to the ground to forage. If there’s a really tall fruit tree, they’ll go higher and you just have to wait. Can you get close to them? They did not run from me. That was one reason I wanted to stay at this field site. Nobody had bothered them, so they weren’t afraid of humans. They were curious, at first. The juveniles would just look at me. But after maybe two months, they became what you would call habituated. To them, I was just part of their landscape. Among monkeys, are there memorable characters? Not many, no. Squirrel monkeys are really a pain to study. They’re only two pounds, max. Max. That’s like a big one. And they’re extremely agile. It’s difficult to recognize individuals because a) they’re small, so there’s not a lot of distinguishing features, b) they’re fast and c) there’s 50 of them in a social group. I only recognized the ones that had a broken tail or some natural markings. There was this male that had a wart here (points to cheek) and I knew him. Males are easy to distinguish from females because of body size. He was also a bully. The interesting thing is that the females are dominant to the males at least in this species. Not only that, but the juveniles also bully the males in the mating season. I don’t know that we see that in many other primates. What else makes them special? One strange thing is they don’t groom. They live in groups that are very large, of 40-50 animals, but they hardly show your classic primate social behavior. So, for example, you see baboons and macaques sit there and groom, groom, groom. Squirrel monkeys don’t do that, but they are extremely vocal. They make a lot of calls we don’t know how to distinguish yet. Probably that’s how they maintain their bonds, by communicating vocally. What does it mean that the males are subordinate? The males tend to stay on the periphery of the group. They don’t even come near the mothers with the babies. When the mating season comes, which is just two months of the year, the males come in, but once it is over, they go back to the outer corners of the group. Because they’re dominant, the females are not coerced by the males. If a female is not interested in mating, she will just walk away. You observed “fattened” males that are favored by females. What is that about? I can’t say for sure if a particular male is being favored by a female because we don’t have them all marked. We do know on average that the “fatter” males spend more time with the females during mating season. Presumably they’re getting more mating opportunities. By the way, it’s not that they’re eating more. The “fattening” is only in the upper body, and most of it is water, and some fat cells. It’s like the padding that football players wear. Did you just say you “mark” them? In 2012, I decided that we should trap some of the monkeys to mark them – to put on individual collars, microchips, get some blood. We had to develop a new method to trap them, because nothing that was standard for any other primate worked. They’re very smart. They’re like, “Why should I go into this weird structure?” But they will in November, the driest month of the year, because they’re hungry. was no evidence that these monkeys had rabies. Is your real interest in the subordinate males? The males are fascinating to me because of the whole “fattening” thing. No other primate does this in quite the same way. We still don’t know why they do it. We know a lot from the lab about how it happens – the physiology, the hormones that are involved. But as an evolutionary biologist, I wanted to know why. Is there a function to this? Does being “fatter” give them some sort of advantage? And it definitely seems to help with male-male competition. There’s a lot of fighting in the mating season. The males will wrestle; sometimes they’ll fall to the ground and have cuts and gashes. Fatter is definitely intimidating for another male. And as you’ve asked: Is fatter sexier? I think there’s a really good chance that it is sexier for the females. But since the females don’t solicit copulation – they don’t walk up to a male and present their hind quarters – it’s difficult to say. That is, I didn’t observe them encouraging these males to mate with them. But they did allow these males proximity. The males that were skinnier: the females just ignored them. Apart from the scientific findings, what has all this taught you? The one full year that I spent in the field, at 25, was the best experience of my life. I quickly got lonely and realized there was a community in the village that didn’t know who I was or why I was there. Even adults had misconceptions about the forest, like that snakes were everywhere waiting to bite. In the later months, I went into schools in the village and did conservation education. One 8-year-old girl would come to my backyard every day and ask to help me watch the monkeys. I couldn’t take her every day, obviously. And an incredible thing happened. My field assistant, who was about 38, and his wife and five kids had been living in a tiny house made basically of mud, and their dream was to build a house with regular walls. I was a poor grad student, but with the money I paid him every month, they built their house! The family always says, we have our house because of Anita and the monkeys.